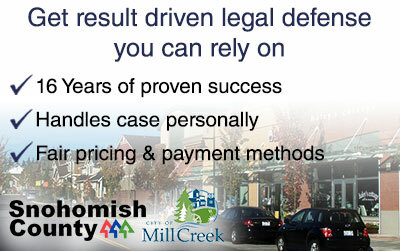 Have you been charged with a crime in Mill Creek, WA? Hi, my name is Schoen Parnell and I’m a Mill Creek criminal defense attorney with over 16+ years of experience defending clients in Snohomish County. Being charged with a crime can be a stressful experience for anyone. I understand your employment and general livelihood are at risk and do not take the matter lightly. My clients have learned to lean on my proven strategies, sound judgement and wisdom to know which direction they should take with their case. I personally represent all of my clients who have access to my cell phone number day or night. To ensure only the highest standard in the quality of my criminal defense services I limit my caseload to usually less than 40 open and active clients. I serve on the WACDL’s (Washington Association of Criminal Defense Lawyers) legislative committee which monitors proposed laws as well as testifies before the Washington state house and senate committees. This allows me to know if changes in the law could affect our defense strategy and to ensure your rights are protected in the state legislature. A combination of experience, wisdom and a solid network of resources gives me the ability to craft defense strategies which have earned me the reputation for fighting hard for my clients. Time is always a factor in any criminal case, it’s important for you to know what challenges and consequences you could be facing ASAP. Contact my law office and request a free, no strings attached consultation where I will be able to outline some of these challenges as well as propose a strategy for your case. If a Mill Creek police officer arrests and charges you with a misdemeanor or gross misdemeanor, your case will be heard in the Snohomish Count District Court’s (SCDC) – South Division located at 20520 68th Ave. W. Lynnwood, WA 98036. Mill Creek does not have it’s own prosecuting office, instead it contracts with a private law firm named Zachor & Thomas. However if you’ve been arrested by WA State Trooper or a Snohomish County Sheriff Deputy, your case will be prosecuted by the Snohomish County Prosecuting Attorney’s Office in Everett. Misdemeanor state cases will be held in the Snohomish County District Court’s South Division courthouse located in Lynnwood, WA. Both felony state cases and felony cases that arise from an arrest made in Mill Creek will be held in the Snohomish County Superior Court in Everett. In all of the above instances inmates are booked into the Snohomish County jail located in downtown Everett.